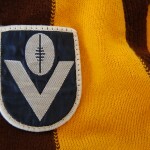 The history of the Football Jumper. 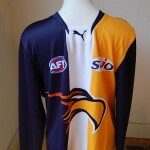 The team strip and colours are the same for all, only the style and what they are made of changes through the years. Every jumper tells a thousand stories. Lots of families have stories passed down from generation to generation that have long since become legend, true or not complete with many embellishments. Every jumper tells a thousand stories indeed Australia's changing fiscal wealth can be traced through the remodelling and restyling of the same basic model. 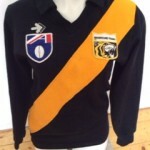 The history of the jumper is as old as the sport itself and can be traced as an historical document. Originally made in wool, with long sleeves, button up front and peak collar with a striped sash or two and three colour combinations. When Australia jumped off the sheep's back the jumpers became a mix of acrylic and wool , nylon and wool or acrylic and wool, ending up with today's modern incarnation of polyester no wool in sight . Hurray breathed the baby boomers who had fond memories of scratchy damp smelly wool mix misshapen jumpers rubbing bodies and arms. 100,s of kids letting out blood curdling screams as the battle cry was raised - get the ball. Footy has embraced the great Australian dream of a fair go for all, and footy is a sport played by all for all, anywhere, any time. It is truly a national sport. It is a familial and generational thing. You go to the footy with your family who go for the Pies because they were born to it. You have always gone to the footy with your whole family, even when you are grown up and are taking your kids, meeting in the same area and going for the same team you were born to.